Finest greetings to you this morn. 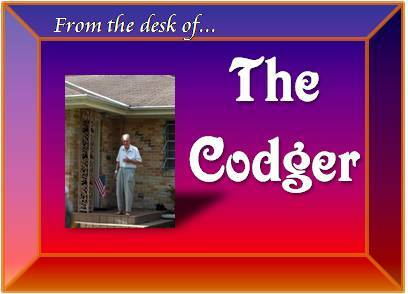 Somehow, you find yourself reading this lifestyle column, From the Desk of The Codger, written exclusively by myself (The Codger). I don’t know if all of you have this button on your computer or not, but it’s for the “^”. I don’t know what that’s called, but I know it’s French. On my computer, it’s on the same button as the number 6. Now I’m not in France, and I don’t see why I would ever need that “^” button, so why do they make it standard equipment? I would much rather have a button for the cent sign. That way I wouldn’t ever have to write all money amounts less than a dollar as “dollar sign, zero, decimal point, amount”…would save a lot of time and megabytes. Not to mention all the catalogs I’ve been getting in the mail lately. Catalogs for stores I’ve never even set foot in! It’s ridiculous. My grandniece Tricia’s friend Jessica has asked me to babysit her baby daughter Nevaeh tomorrow (her name is “heaven” spelt backwards). It’ll be good practice for when Tricia’s baby arrives. Jessica said that she, Tricia, and their babies’ father Derek want to spend the afternoon at the park just being kids and having fun. I told her, I said, “Don’t think twice about it. You kids go out and have fun.” Derek’s job as Secretary of My Home Land’s Security starts on Monday, so I hope he enjoys his last moments of freedom while they last!